Non-covalent intermolecular links are ubiquitous in chemical and biochemical systems like protein-drug, peptide-peptide, carbohydrate-drug and antigen-antibody binding are a few examples. Association constants provide an important measure of the affinity of a solute to a ligand, hence the determination of binding constants has been an important step in describing and understanding molecular interactions. Various analytic techniques have been established to measure binding constants. They can be categorized into two groups: Separation-based and Non-separation-based methods. Separation-based methods physically separates the free solute and the bound solute, and evaluates their concentrations. Depending on how the separation is achieved, they can be further classified as heterogeneous or homogeneous. Chromatography, dialysis, ultrafiltration, surface-plasmon resonance (SPR) are heterogeneous methods. The free solute is separated from the bound one on the surface of a solid substrate. Affinity capillary electrophoresis (ACE) and electrospray ionization mass spectrometry (ESI-MS) are homogeneous methods. The separation occurs either in solution or in the gas phase. Non-separation-based methods monitor the change in specific physicochemical properties of the solute or ligand upon complexation. This category includes: spectroscopy (e.g., ultraviolet-visible (UV-Vis), infrared (IR), fluorescence, and nuclear magnetic resonance (NMR), electrochemical methods (e.g., conductimetry, potentiometry, and polarography) and, phase-solubility and hydrolysis kinetics. Ground-breaking work using electrophoresis as a separation method was first performed by Tiselius dating back to 1937. He found that proteins in buffer solution moved in the electric field in one direction and at a rate determined by their charge and size. In the early years electrophoretic separation was performed in media such as agarose and polyacrylamide gels. The introduction of open tubular columns in the early 1970s with column diameters in the submillimeter range was an important milestone in free solution electrophoresis, and led to a significant increase in separation efficiency. Due to their small diameters (50–100 m), the currents flowing through the capillary are very small, only in the microampere range, thus allowing a high separation voltage up to 30,000 volts at a concurrently low power consumption in the range of milliwatts. A further advantage of the possibility of utilizing high voltages is the significant reduction in analysis time, which in turn decreases zone broadening, leading to high separation efficiency. During the 1980s many practical aspects of sample introduction and analyte detection were solved, helping to establish capillary zone electrophoresis (CZE) as a high-performance analytical technique. The first capillary zone electrophoresis systems became commercially available in the late 1980s. Electrophoresis is a analytic technique where ions in a sample move under the influence of an applied voltage. Electrophoresis can be used just as well to observe molecular or noncovalent interactions of biopolymers, provided the complex has distinct electrophoretic properties different from those of the free molecules. There are a wide variety of techniques that can be used to estimate affinities between biological species including size exclusion, equilibrium dialysis, sedimentation, slab gel electrophoresis, and fluorescence quenching. Many of these techniques frequently require the separation and quantification of free and/or complexed molecules in an equilibrium mixture. Over the past two decades electrophoresis has been used as an analytic technique to separate particular ions of interest like DNA, RNA and protein from fluids. The technique has successfully replaced other conventional methods that were used in molecular analysis. The method has been a boon and has been used extensively in medical diagnostic, molecular diagnostic, drug screening, forensic, analysis of protein in blood, analysis of urine, analysis of CSF and various other laboratory and clinical methods. The separation of the charged particles is brought about by the electrokinetic potential. The mobility of the ion is related directly to its charge. When an electric field is applied to the buffer solution containing the sample, the components present in the sample migrate toward their respective charges at different speed. The positive ions migrate toward the negative electrode and the negative ions migrate toward the positive electrode. When a filter is placed in the path of molecule, the charged particles can be separated not only by charge but also size. Some of the advantages of the technique is necessity of small amount of sample and reagents, ability to separate large and small analytes. The versatility of this technique has made it a convenient and in most cases preferred to other methods such as high performance liquid chromatography (HPLC) and gas Chromatography (GC). The difference between HPLC and electrophoresis is that in HPLC the separation force is the affinity of the sample towards the stationary phase. In electrophoresis the separating force is the difference in the charge to size ratio, when current is applied smaller particles will get migrate faster towards there electrodes due to less friction, while a large particle will move comparatively slower due to drag force and friction experienced due to a larger surface area. Affinity capillary electrophoresis (ACE) is a technique that is used to measure the binding and dissociation constants of formed bimolecular complexes. It is a versatile technique to study the noncovalent interactions of receptors to neutral and charged ligands. ACE is based on the differences in the values of electrophoretic mobility of free and bound receptor. ACE technique uses the determining power of capillary electrophoresis (CE) to differentiate between free and bound forms of a receptor as a function of the concentration of free ligand. The Scatchard equation is used to determine the fraction of bound receptor at equilibrium and is generally used to estimate values of dissociation constants of receptor-ligand complexes. Binding constants can be calculated under the following conditions. The analyte must undergo a change in electrophoretic mobility upon complexation. That’s why one of the binding partners must have a sufficient charge. At least one of the binding partners must be detectable by the method. There must be a fast adjustment of equilibrium between the free and the complexed form of analyte, compared with the separation time. There are no interactions of binding partners with the capillary wall. The electric field does not influence the formation. A coelectrophoresed reference for converting detection times into mobilities must not be influenced by the presence of the binding partners. Protein-Protein interactions(PPI) are important in virtually all biological process. Understanding of these reactions will aid in designing novel and effective drugs/. Advances in molecular biology have yielded great insight into interactions between numerous biologically relevant molecules. Such interactions are critical in understanding the functions and molecular mechanisms of biological systems and the roles these interactions play in health and human disease. ACE is used as a high screening to establish and define the binding interaction between a therapeutic target protein and natural or chemical molecules. This technique is also used in the measuring the binding constants, estimation of kinetic rate constants and the stoichiometry of protein-protein interaction. The electrophoretic separation principle is based on the velocity differences of charged solute species moving in an externally applied electric field. The direction and velocity of that movement are determined by the sum of two vector components, the migration and the electroosmotic flow (EOF). Whereas the ionic mobility is a physical constant specific to individual ionic species, the EOF is dependent on the properties of the interface of capillary wall and solution. ACE is based on the electrophoretic separation of analytes, under soluble conditions in which the analyte carries a net charge. With proteins, CE conditions are established to a pH using buffers. This pH is different from proteins isoelectric point to prevent precipitation of pH. The rate at which the transfer occurs is target specific, generally, it is dependent on the ratio of charge to mass. Different proteins or isoforms migrate with an individual velocity. Detection is done with the photomultiplier tube. A target CE profile is created. This technique has high resolution. This fact is contributed to high field strengths and short run-time. The sub-nanomolar concentration of proteins can be calculated using laser-induced fluorescence detection. If a binding has occurred it alters the rate of migration of the protein, which will result in a different protein profile. ACE requires a short analysis time. It requires only minutes. ACE is automatable for high-throughput screening. It can be used to find the relative strength of binding. It can distinguish the targeted protein from background fluorescence. To perform capillary electrophoresis the following basic components are necessary: a high voltage power source, a detector and a buffer filled capillary. The capillary is shaped like a tube made out of fused silica and is open at both the ends. This material has at its surface silanol groups (Si – O – H). The capillary tunnel walls re slightly acidic and have a negative charge and the buffer usually has a negative charge. The buffer is the solution which will assist in transporting the analytes and is connected to external volatge. Since the buffer solution is negatively charged it gets attracted to the capillary wall and it lets the molecules to flow steadily through the inside of the tunnel. In the buffer fluid positive charges will be present because of the law of electrical neutrality. When a high voltage is applied over the capillary, the positive charges will start to move towards the cathode through the capillary. This flow is called the Endo Osmotic Flow (EOF). It is well possible to calculate a mobility of this EOF. The higher the pH, the more negative charges on the capillary wall and the more positive charges in the fluid. This will generate a stronger EOF. The sequence of ions arriving at the cathode depends upon the charge and size of the ions. The smaller the ions the faster they reach towards their respective electrodes. The mobility of an ionic species is directly proportional to the ratio of charge to radius q/r and reciprocal to the viscosity of the solution. Thus, small, highly charged ions have high mobilities, whereas large, less charged species have low mobilities. Buffers are used at certain pH for separation as charges of ions is strongly dependent on its pH value. In buffers at higher pH value there are a lot of negative charges at the capillary wall (Si – O-).For example propionic acid (pK value 4.87) will be almost completely negative charged at pH 7. The mobility of the propionic ions will be faster. At pH 3, where about 80 % of the propionic is neutral, the mobility will be much lower. By altering the pH of a buffer system, the mobilities of the different components can be altered to achieve the best separation. In general the best pH for a separation is between the pK values of the sample components. Three different interacting phases can be distinguished in ACE: the stationary, pseudostationary, and mobile phases. First, the interaction can take place at the surface of a coated capillary wall or at a stationary phase present in the capillary. Second, the interaction can take place in pseudostationary phases, such as micelles, microemulsions, and liposomes. Third, the interaction can take place when both the solute and the affinity molecule are in free solution. The second importnant parameter influencing the movement of all solutes in free-zone electrophoresis is the electroosmotic flow. It can be described as a bulk hydraulic flow of liquid in the capillary driven by the applied electric field. It is a consequence of the surface charge of the inner capillary wall. In buffer-filled capillaries, an electrical double layer is established on the inner wall due to electrostatic forces. The double layer can be quantitatively described by the zeta-potential and it consists of a rigid stern layer and a movable diffuse layer. The EOF results from the movement of the diffuse layer of electrolyte ions in the vicinity of the capillary wall under the force of the electric field applied. Because of the solvated state of the layer forming ions, their movement drags the whole bulk of solution. Under aqueous conditions the capillary walls silanol groups can deprotonate and the capillary wall will form a negative charge. Hence, cations from solution are attracted to this negatively charged capillary surface, leading to an electrical double layer having a positively charged diffuse zone that moves toward the cathode. This causes a net flow of all solutes, cations, neutrals, and even anions towards the cathode. Thus all the specie can be detected in a single run. The receptor is usually dissolved at a certain concentration in the buffer electrolyte, which is in both electrode vessels and in the capillary. Maintaining all other conditions constant, only the concentration of the receptor in the buffer system is varied in a defined concentration range. The drugs (center molecules/ligands) are injected as a narrow sample zone. While migrating through the tube, the drugs interact with the receptor molecules. As a consequence the magnitude of electrophoretic mobility changes, depending on the magnitude of binding constant as well as the concentration, size, and charge of the binding partners. The electrophoretic mobility of a molecule in free solution is proportional to its electrical charge, q, and inversely related to the hydrodynamic radius, r, which depends on the molecular mass, M.
The electrophoretic mobility of the drugs is determined from the electropherogram by the known equation, taking into account the electro-osmotic flow. Often, small and highly hydrophilic compounds, which are not retained by the CDs, are preferred to measure the EOF. There are several ways to estimate binding constants. For graphical determination, the electrophoretic mobilities are plotted against the logarithm of the complexing agent’s concentration. From the plateaus of the graph, the mobilities of free and complexed forms of the drug are determinable. Nonaqueous capillary electrophoresis is a new technique that matured over the last couple of years to complement the electrophoretic techniques performed under aqueous conditions. The use of organic solvents in nonaqueous capillary electrophoresis not only increases the solubility of the solutes, but also allows one to control important characteristics of the separation. For selection of protein binding interaction with high efficiency NECEEM is a powerful tool, it allows ligand development with lesser sequences of selection. NECEEM can also be equally used for choosing ligands and finding their binding constant. Also, due to its wide-ranging kinematic capabilities, this technique can simplify selection of ligands with predefined Kd, koff, and kon of the ligand−target interaction. The nonequilibrium ACE of equilibrated mixtures of analyte and ligand at different analyte–ligand ratios in the background electrolyte (BGE) free of ligand and analyte can be used for strong or slowly dissociating complexes. From the peak areas of the analyte, ligand, and analyte–ligand complex, their equilibrium concentrations and the stability constant of the complex can be determined. Dynamic ligand exchange-affinity capillary electrophoresis (DLE-ACE) is a useful platform for evaluating the conformational stability and relative affinity of a protein to different ligands without off-line sample pretreatment, since ligand exchange and protein unfolding processes are integrated in-capillary during electromigration. Dynamic equilibrium ACE of an analyte in the BGE contains a free ligand at several distinct concentrations. Electrophoretic migration of the analyte is slow as a result of the formation of the analyte–ligand complex. The advantage of this mode, is that the analyte need not be perfectly pure and concentration of the analyte need not be exactly known since estimation of the stability constant is based on measurement of analyte effective mobility. Partial filling ACE (PF-ACE) is a special ACE mode in which only a part of the capillary is filled with ligand solution in the BGE. This technique has several advantages over classical ACE. Instead of adding the ligand at several concentrations to the BGE in the whole capillary and in one or both electrode vessels, the use of a short ligand zone means that the consumption of the valuable ligand is very low. The binding constants can be calculated from a slope of linear dependence of analyte migration time changes on the substance amount of ligand in the ligand zone in the capillary. In frontal analysis, a large plug of the pre-equilibrated mixture, containing the substrate, the ligand, and the complex formed in the buffer, is injected into the capillary. The capillary is filled only with buffer.In frontal analysis ACE (FA-ACE), a long zone of equilibrated mixture of analyte–ligand complex at different analyte–ligand ratios is introduced into the capillary, and in the applied electric field the complex dissociates and the zones of free analyte, analyte–ligand complex, and free ligand are formed. In the frontal analysis (FA) method, the capillary is filled with buffer and a large sample plug of pre-equilibrated S and L is injected. Where [S], [L], and [SL] are the concentrations of the free solute, free ligand, and solute-ligand complex. Depending on the dimensions of the capillaries about 5-20 % of the capillary volume is taken as sample, the sample volume is typically 20-200 nL. Two assumptions are taken into account, first it is assumed that SL and L have roughly the same mobility and that the mobility of S differs considerably. Next assumption is that the dissociation rate of the complex is slow enough that it can be neglected. Upon application of the electrical field, free S begins to separate from the mixture. Two peaks will be noticed. First peak will correspond to free S and plateau and the second peak will relate to S + SL. From the heights of the analyte or ligand zones on the electropherograms, their equilibrium concentrations, binding constants, and stoichiometry of the complexes can be determined. Throuh this method the concentration of free S can be determined from its peak height through external calibration. These parameters can also be determined by a special mode of FA-ACE, continuous FA-ACE, in which the analyte–ligand complex at different analyte–ligand ratios is electrokinetically introduced in the capillary. The Hummel–Dreyer method was first developed for chromatography and then adapted to capillary electrophoresis. A small sample of the ligand, dissolved in buffer, is injected into the capillary. The capillary as well as source and destination vial are filled with buffer containing the substrate. In the ligand-containing sample, the initial concentration of the free substrate is depleted to the equilibrium concentration. The depletion peak moves with the velocity of the substrate, and its area corresponds to the bound substrate. The complex and the ligand cause a positive peak.Calculated in concentration units, the positive complex peak embodies the same area as the negative peak of the substrate depletion. To get the concentration of free substrate, the negative peak area must be calibrated against the substrate concentration. This is done by injection of different concentrations of substrate (without ligand) into the capillary. In the vacancy method, the separation buffer contains all the complex-forming ingredients; as sample, an empty buffer solution is injected. The concentration gaps move in the electric field according to the mobility of the corresponding substances that were depleted in concentration. The substrate vacancy peak area corresponds to the amount of free substrate, whereas the complex vacancy peak area corresponds to the amount of complex that was displaced during injection. For calibration the buffer is mixed with increasing concentrations of substrate and then injected. By plotting the added substrate against the peak area, the free concentration can be determined by interpolating to zero absorbancy, the concentration needed to fill up the vacancy peak. Affinity capillary electrophoresis is a versatile method for the determination of binding constants. It needs only a very small amount of substance and as a result of the high-resolution power of capillary zone electrophoresis, the method can even be applied for the determination of the affinity of individual components of an crude mixture against a certain ligand. Hummel– Dreyer and vacancy analysis provide additional data from the peak area, whereas frontal analysis directly reads the concentrations from the detector response. ACE benefits from a number of advantages over complimentary analytical techniques: 1) only minute quantities of material are required; 2) sample need not be pure provided CE can distinguish the analyte of interest from the impurities; 3) radiolabeling of molecules is not necessary; 4) automated CE instrumentation is available, and; 5) molecular interactions can be characterized in free solution. The separation efficiency is determined by the peak width. The width of a peak, or, in other words, the length of a solute zone, is affected primarily by diffusion phenomena leading to a broadening of the solute zone. In addition, in capillary zone electrophoresis, zone broadening can be caused by thermal effects, electrodispersion, or adsorptive effects. In conventional slab-gel electrophoresis the feasibility of using high voltages is limited, due to considerable power consumption leading to heating of the gel slab. Heating is problematic, since it can cause non-uniform temperature gradients, local viscosity changes, and, therefore, zone broadening. When an electric current is passed through a conductive medium, heat is generated (Joule heating). The temperature increase depends on the power, i.e., the product of current and voltage, and is determined by the conductivity of the buffer and the voltage applied. Significantly elevated temperatures will result when power generation exceeds the amount of heat that can be dissipated. The use of narrow-bore capillaries greatly reduces this heating effect, because heat can be more efficiently dissipated due to a favorable surface- to-volume ratio. This improved heat dissipation means that higher operating voltages on the order of several ten thousand volts can be applied. It is advantageous to use narrow-inner-diameter capillaries with large outer diameters. The smaller the inner dimensions, the higher the surface-to-volume ratio, which helps to dissipate the generated heat through the capillary wall. The large outer diameter is advantageous due to an improvement of heat transfer to the surroundings. Interactions between the solutes and the capillary wall also have a negative effect on the efficiency in capillary zone electrophoresis. Both hydrophobic interactions and electrostatic interactions of cations with the negatively charged capillary wall can be the cause of solute adsorption. Significant adsorption has been found for high-molecular-weight species, e.g., peptides and proteins. Because of the increased surface-area-to-volume ratio of narrow-bore capillaries, this effect is even more pronounced. Borosilicate capillary: 50 μm, 75 μm, 100 μm diameters. Surfactants: Brij-35, Triton X-100, and CHAPS. Protein labeling reagents (Molecular Probes). Vascular endothelial growth factor (VEGF-165). Vascular endothelial growth factor receptor (VEGF-r1). Stock buffer: 20 mM Tris-HCl, pH 8.0, 5 mM DTT, 0.1% CHAPS, 150 mM NaCl. Sample buffer: 20 mM Tris-HCl, pH 8.3, 1 mg/mL BSA. Running buffer: 50 mM Tris-HCl, pH 8.3, 1 mg/mL BSA. Growth factor–growth factor receptor interactions are the initial step of many signal transduction events the direct cell growth, differentiation and apoptosis. Vascular endothelial growth factor (VEGF) and its receptor interaction is studied in this example using ACE. In this assay, VEGF-165 was labeled with FITC in 30 mM HEPES buffer using a dye to protein molar ratio of 10:1. Labeled target was separated from free dye using microsep spin columns. The concentration of the purified material was obtained by using the Bradford Assay with BSA as a standard. Equal molar amounts of VEGF and VEGFr1 (50 nM of each in stock buffer) were used in these experiments by dilution of each into Tris based sample buffer. The sample was kept at 4°C prior to injection onto the capillary. Crude natural extracts in 100% DMSO were added to the running buffer to the level of 1%; clean DMSO was used as a control. Within the capillary, labeled VEGF migrates within a large segment of BSA that is provided with the target protein. When VEGF is labeled in a mixture containing excess BSA, then BSA will also be labeled. Thus, the unbound labeled VEGF is not visible in the CE electropherogram due to excess labeled BSA. Upon the addition of unlabeled VEGF-r1, the VEGF/VEGF-r1 complex shifts away from the labeled BSA and is visible as a separate peak.This slower migration is expected as the receptor is basic and its binding to VEGF would provide for a complex of slower mobility than the growth factor alone under these conditions. In theory, the fluorescently labeled (FL)-VEGF/VEGF-r1 complex CE profile would be sensitive to hits interfering with complex formation and one might hypothesize that molecules that interfered with binding would manifest as a loss in signal of the complex peak. As the concentration of unlabeled VEGF is increased, it competes with the labeled VEGF for binding to the VEGF-r1, resulting in increasing amounts of unlabeled-VEGF/VEGF-r1 complex formation and a decrease in the amount of FL-VEGF/VEGF-r1. This results in an overall loss of labeled complex signal.These data may be interpreted to indicate that sample, which caused an overall loss of labeled complex signal, would be selected for further study (fractionation, testing of fractions for activity, and isolation of chemical entity.) In screening a large number of crude extracts, we found the primary hit rate using this format to be approx 1%. 15N-labeled Raf-CRD and unlabeled Ras. NMR buffer: 30 mM d11-Tris-d3-acetate (Isotec, Miamisburg, OH), pH 6.5, 100 mM NaCl, 10 μM ZnCl2, 1 mM d10-DTT, 10% D2O, 0.01% NaN3. Bruker AMX 500 NMR spectrometer or Varian Inova 600 MHz NMR spectrometer. 5.0 mm Wilmad standard NMR sample tube. The Raf-CRD has expressed as glutathione S-transferase (GST) fusion protein and purified by affinity chromatography. Uniformly 15N enriched Raf-CRD protein was obtained by growing Escherichia coli in a supplemented minimal media with 99.8% 15 NH4Cl as the sole nitrogen source. The purified protein was concentrated to 2 mL in 30 mM Tris acetate at pH 6.5, 75 mM Na2SO4, 10 μM ZnCl2, 1 mM DTT and was exchanged into NMR buffer 30 mM d11-Tris-d3-acetate at pH 6.5, 100 mM NaCl, 10 μM ZnCl2, 1 mM d10-DTT, 10% D2O, 0.01% NaN3] using a gel filtration column. All NMR samples had the final volume of 500 μL. The Raf- CRD NMR sample contained 0.28 mM uniformly 15N-enriched Raf-CRD alone or mixed with wild-type unlabeled Ras at concentrations ranging from 0.30 to 0.77 mM. NMR experiments were recorded on a Bruker AMX 500 (500 MHz) spectrometer at 12°C or a Varian Inova 600 (600 MHz) spectrometer at 25°C. Two-dimensional 1H–15N heteronuclear single quantum coherence spectroscopy (HSQC) experiments were performed with pulse field gradient and water flip-back methods. Data were acquired with 1024 × 256 complex data points and a spectral width of 7042.25 Hz for the 1H dimension and 1000 Hz for the 15N dimension on the Bruker AMX 500. HSQC experiments conducted on the Varian Inova 600 spectrometer were acquired with 1024 × 128 complex data points and a spectral width of 8000 Hz for the 1H dimension and 1700 Hz for the 15N dimension. NMR data were processed and analyzed using the program FELIX. Proton and 15N resonance assignments of the Raf-CRD were determined previously in this laboratory. Two-dimensional 1H–15N HSQC data were acquired on the Raf-CRD-Ras complexes at four different molar ratios: 1:2.75, 1:1.65, 1:1.1, and 1:0. The final concentration of 15N-Raf-CRD was 0.28 mM and unlabeled Ras ranged from 0.77 to 0.30 mM. Samples containing the highest molar ratio (1:2.75) of the Raf-CRD–Ras complex (0.28:0.77 mM) and Raf- CRD alone (0.28 mM) were prepared first. To prevent changes in sample volume and buffer composition, the other two complexes (molar ratio 1:1.65 and 1:1.1) were made by exchanging 200 μL of the two samples containing the highest molar ratio (1:2.75) and the sample alone (1:0) to achieve a final sample volume of 500 μL. A fluorescence-based binding assay was used to determine the binding affinity between the Raf-CRD and Ras. Owing to solubility limitations, a quantitative measure of the Kd could not accurately be determined. However, our estimated Kd of 300 μM indicated that the binding interaction between Raf-CRD and Ras was likely to be in fast exchange on the NMR time scale. During the titration, we expected to see only one peak that represents a weighted population of free and bound states. Given an estimated Kd of 300 μM for the Ras/Raf-CRD interaction, the NMR experiments were conducted under conditions ranging from approx 0 to 66% occupancy, and the full extent of chemical-shift changes (full saturation binding) will not be sampled. However, if our Kd is underestimated, our fractional occupancy will be less than 66%. Even though the chemical-shift changes will be smaller than would be anticipated for a titration that reaches saturation binding, these experiments, nevertheless, report chemical-shift changes that allow mapping of the binding interface. To elucidate the residues of the Raf-CRD important for Ras binding, we evaluated 1H–15N HSQC NMR spectral changes associated with binding of Mapping Protein–Protein Interactions by NMR 83 Ras to the 15N-enriched Raf-CRD. The 1H–15N HSQC experiment will give rise to a spectrum of proton chemical shifts in one dimension and the chemical shifts of the covalently attached 15N nucleus in the second dimension, so only peaks corresponding to 15N-enriched Raf-CRD will be observed. Among the various HN resonances detected are the amide protons. Therefore, the HSQC peaks provide a site-specific probe for every residue in Raf-CRD with the exception of proline. NMR spectral changes in the Raf-CRD after the addition of Ras (molar ratio 1:2.75, as a superposition of a portion of 1H–15N HSQC spectra of uniformly 15N-labeled Raf-CRD in the presence (black) and absence (gray) of unlabeled Ras. Raf-CRD residues that show distinguished changes in 1H and 15N chemical shift and/or peak intensity are labeled. Most of the chemical-shift differences observed between the free Raf-CRD and the complex are localized to Raf-CRD residues 144, 145, 148–150, 158–164, and 174–176. The largest 1H chemical-shift changes observed showed slightly smaller chemical-shift changes. The average change of the 1H chemical shifts for the rest of the peaks was less than the line width, indicating that the global structure of Raf-CRD is unchanged due to the association with Ras. The same trend was observed in the 15N chemical shift changes. Uniformly reduced peak intensities (approx 55%) were also observed for a number of peaks, which likely reflects additional relaxation mechanisms due to interaction with the Ras protein. The largest variation in intensity changes for the amide peaks was found for residues 141, 145, 148–150, 158, and 170. Clearly, residues 148–150 and 158–164 at the top of the molecule are identified as part of the binding interface. Consistent with these observations, an L149T/F151Q Raf-CRD mutant exhibits reduced binding affinity to Ras in vitro. Moreover, the L149T/F151Q mutation when placed in the context of full-length Raf showed impaired Ras-mediated Raf activation in vivo (4). During preparation for SDS-PAGE, proteins are typically reduced and denatured via treatment with Laemmli sample buffer. Because many protein– protein interactions rely on aspects of secondary and tertiary protein structure that are disrupted under reducing and denaturing conditions, it might seem likely that few if any protein–protein interactions could survive treatment with SDS-PAGE sample buffer. Nonetheless, it is well known that many types of protein–protein interaction do in fact still occur even after one of the partners has been reduced, denatured, run on SDS-PAGE, and Western blotted. Blot overlays are a standard and very useful method for studying interactions between proteins. In principle, a blot overlay is similar to a Western blot. For both procedures, samples are run on SDS-PAGE gels, transferred to nitrocellulose or PVDF, and then overlaid with a soluble protein that may bind to one or more immobilized proteins on the blot. In the case of a Western blot, the overlaid protein is the antibody. In the case of a blot overlay, the overlaid protein is a probe of interest, often a fusion protein that is easy to detect. The overlaid probe can be detected either via incubation with an antibody (this method is often referred to as a “Far Western blot”), via incubation with streptavidin (if the probe is biotinylated), or via autoradiography, if the overlaid probe is radiolabeled with 32P. SDS-PAGE 4–20% mini gels (Invitrogen). Western blot transfer apparatus (Invitrogen). SDS-PAGE pre stained molecular weight markers (BioRad). SDS-PAGE sample buffer: 20 mM Tris-HCl, pH 7.4, 2% SDS, 2% β-mercaptoethanol, 5% glycerol, 1 mg/mL bromophenol blue. SDS-PAGE running buffer: 25 mM Tris-HCl, pH 7.4, 200 mM glycine, 0.1% SDS. SDS-PAGE transfer buffer: 10 mM Tris-HCl, pH 7.4, 100 mM glycine, 20% methanol. Anti-GST monoclonal antibody (Santa Cruz Biotechnology, cat. no. sc-138). Goat anti-mouse HRP-coupled secondary antibody. Blocking buffer: 2% nonfat powdered milk, 0.1% Tween-20 in phosphate-buffered saline, pH 7.4. The purpose of this step is to immobilize the samples of interest on nitrocellulose or an equivalent matrix, such as PVDF. It is very important to keep the blot clean during the handling steps involved in the transfer procedure because contaminants can contribute to increased background problems later on during detection of the overlaid probe. Place gel in SDS-PAGE apparatus and fill the chamber with running buffer. Mix purified hexahistidine-tagged fusion proteins with SDS-PAGE sample buffer to a final concentration of approx 0.1 μg/μL of the fusion protein. Load 20 μL of the fusion protein (2 μg total) in each lane of the gel. If there are more lanes than samples, load 20 μL of sample buffer in the extra lanes. In at least one lane of the gel, load 20 μL of SDS-PAGE molecular weight markers. Run gel for approx 80 min at 150 V using the power supply. Stop gel, turn off the power supply, remove the gel from its protective casing, and place in transfer buffer. Place pre-cut nitrocellulose in transfer buffer to wet it. Put nitrocellulose and gel together in transfer apparatus, and transfer proteins from gel to nitrocellulose using a power supply for 80 min at 25 V.
During the overlay step, the probe is incubated with the blot and the unbound probe is then washed away. The potential success of the overlay depends heavily on the purity of the overlaid probe. GST and hexahistidine-tagged fusion proteins should be purified as extensively as possible. If the probe has many contaminants, this may contribute to increasing the background during the detection step, making visualization of the specifically bound probe more difficult. Block blot in blocking buffer for at least 30 min. Add GST fusion proteins to a concentration of 25 nM in 10 mL blocking buffer. Incubate GST fusion proteins with blot for 1 h at room temperature while rocking slowly. Discard GST fusion protein solution and wash blot three times for 5 min each with 10 mL of blocking buffer while rocking the blot slowly. Add anti-GST antibody at 1:1000 dilution (approx 200 ng/mL final) to 10 mL blocking buffer. Incubate anti-GST antibody with blot for 1 h while rocking the blot slowly. Discard anti-GST antibody solution and wash blot three times for 5 min each with 10 mL of blocking buffer while rocking the blot slowly. Add goat anti-mouse HRP-coupled secondary antibody at 1:2000 dilution to 10 mL blocking buffer. Incubate secondary antibody with blot for 1 h while rocking the blot slowly. Discard secondary antibody solution and wash blot three times for 5 min each with 10 mL of blocking buffer while rocking the blot slowly. Wash blot one time for 5 min with phosphate buffered saline, pH 7.4. The final step of the overlay is to detect the probe that is bound specifically to proteins immobilized on the blot. In viewing different exposures of the visualized probe, an effort should be made to obtain the best possible signal-to-noise ratio. Nonspecific background binding will increase linearly with time of exposure. Thus, shorter exposures may have more favorable signal-to-noise ratios. Incubate blot with enhanced chemiluminescence solution for 60 s.
Remove excess ECL solution from blot and place blot in clear plastic sheet. Tape sheet into autoradiography cassette. Move to a darkroom and place one sheet of film into autoradiography cassette with the blot. Expose film for 5–2000 s, depending on the intensity of signal. Develop film in standard film developer. 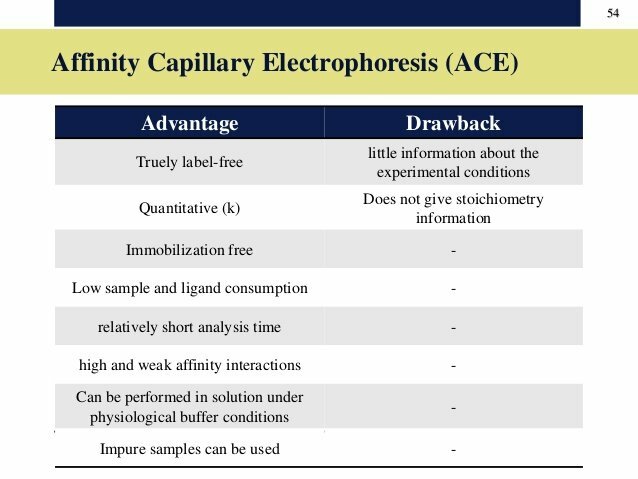 Affinity capillary electrophoresis (ACE) is the most common method used in CE to determine interactions between molecules, involves measuring changes in electrophoretic mobility of the analyte through buffer solutions containing dissolved complexation agents. ACE is suitable for investigating even slight interactions, using simple experimental conditions. This method needs only small quantities of binding partners. An analysis of mixed analytes is made possible by interpreting migration times instead of peak areas. ACE can be a powerful tool for studying DNA–drug or DNA–biopolymer interactions. The techniques called mobility shift or gel shift is widely used in molecular biology to detect interactions between regulatory proteins for gene expression and specific sequences of polynucleotides. Two general approaches are used in affinity CE of DNA complexes, depending on the stability of the complex under investigation. For a system with slow complexation kinetics, such as most high-affinity systems, equilibrium mixture analysis is preferable. In contrast, in the case of relatively rapid on-and-off kinetics, which is a characteristic feature of low-affinity complexes, mobility-change analysis should be applied. In the following, the detection of complex formation between DNA samples and interaction partners such as proteins, peptides, DNA or analogs, and smaller molecules using ACE will be discussed. Electrophoresis of an equilibrium mixture enables the determination of complex bimolecular interactions factors. When the dissociation kinetics of the complex is slow, the complex gives rise to a new peak in the electropherogram, in addition to the peaks of the free component molecules. The extent of association depends on dissociation kinetics and separation time. If the interacting molecules show large differences in their mobility, it may be difficult to detect all free and complexed species in the same electrophoretic run. This can be the case when the interacting molecules have opposite charges, a situation not uncommon for proteins and oligonucleotides. However, even in such cases, complex formation can be detected using a phenomenon of high-affinity systems. The peak of one of the free components disappears when it is mixed with the other, and it rises again when the binding site of the other is saturated. The dissociation occurring in the complex during migration usually results in peak deformation of both complex and free species. The peak size of the complex weakens in the course of the analysis, whereas the peak representing the free species remains stable and relates to the original sample mixture under equilibrium. Since the peak areas are proportional to concentration, peak integration enables quantitative determinations of each free species in the mixture, which is the basis for the calculation of equilibrium constants. Complexes with relatively slow off-rate constants are usually characterized by small dissociation constants. This implies the need for high sensitivity detection, which can be achieved using fluorescence labeling, laser-induced fluorescence (LIF), or ACE coupled with mass spectrometry (MS). The binding of proteins to DNA controls key processes such as transcription, translation, DNA replication, DNA repair, and recombination. Transcription factors control gene expression by binding to specific DNA elements in the promoter region. Inappropriate functioning of such transcription factors contributes to diseases such as cancer and autoimmune disorders. Hence for diagnostic purposes, purification of transcription factors from samples is essential to understand the progressions in order to find the ways of treating it. This task is challenging, because these genes are normally present at very low concentrations. Labeling of a component with a fluorophore facilitates selective detection of the complex even when the separation of the complex from other nonlabeled components is incomplete. The complex can easily be separated from the monomers and quantitative determination is achieved. Another approach in the application of affinity protocols is the addition of ethidium bromide to the size separation medium for double-stranded DNA. This improves the separation capacity of the method at a high field strength to such an extent that even mutations can be detected. DNA mutations of certain genes are the origin of heritable diseases and cancer. In order to discover and, hopefully, prevent these disorders, gene mutation assays are of increasing importance in diagnostics and clinical assays. Capillary affinity gel electrophoresis can be applied to separate oligodeoxynucleotide mixtures using sequence-specific and base-composition specific recognition. The affinity interaction is based on the formation of a complex between the solved oligodeoxynucleotide sample and a DNA analogue immobilized on the capillary gel. The detection of HIV-related viral surface proteins is a very challenging tasks, as AIDS should be diagnosed as early as possible to enable an early and effective therapy of this infection. HIV can be detected by the aptamer strategy to detect reverse transcriptase (RT) of the type 1 human immunodeficiency virus (HIV-1). A direct and specific ACE method has been proposed using laser-induced fluorescence (ACE/LIF) as detection principle. Single-stranded DNA aptamers as probes fluorescently labeled were synthesized. The resulting aptamer is specific for HIV-1 RT, and it exhibited no cross-reactivity with RTs of the enhanced avian myeloblastosis virus (AMV). Affinity capillary electrophoresis can be considered a powerful tool for the analysis of interactions between DNA, RNA, and synthetic analogues on the one hand and proteins, peptides, and nucleic acid components on the other hand. However, the technique seems not yet widely accepted. This is probably due to the rather high cost of the instrument and also the high sensitivity required can be achieved mostly only with laser fluorescence, plus it requires technically demanding setup. The examples discussed here clearly demonstrate general advantages: speed, sensitivity, and the possibility of quantifying the results. It can be expected that the technique will gain in importance, since capillary electrophoresis instruments are readily available with LIF detectors, and the development of microfluidic devices based on chip technologies will have another impact in the coming years.